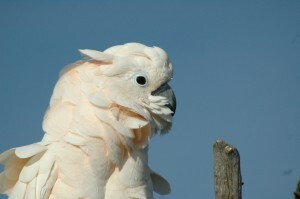 A five-year old Moluccan cockatoo joined my flock of three cockatoos last November. Sam arrived perfect in every way, with an enviable upbringing, having been left unclipped his entire life, and coming from a warm family with plenty of other flock mates. 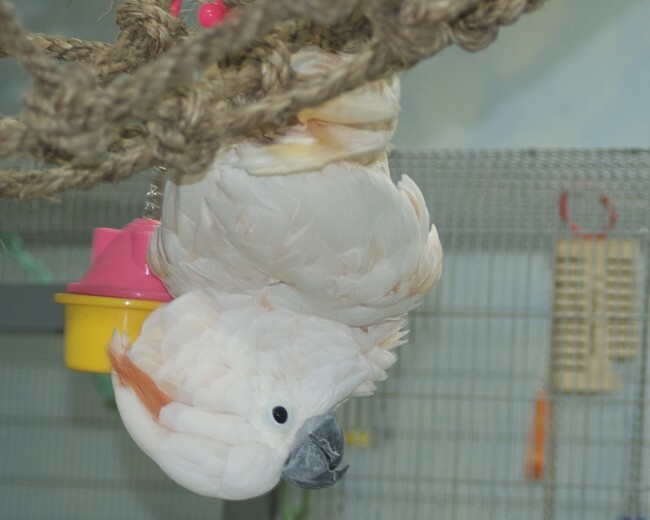 He used his loud, enthusiastic voice at predictable ties, destroyed toys with glee, and soon enjoyed flying and swinging around the bird room with his fast friend, my brazen bare-eyed cockatoo, Juice. It became apparent early on that Sam hated bathing. The mere sight of the spray bottle, which elicited expectant wing flaps and tail wiggles from the other three, send him flying to the far end of the bird room. Bringing him into the bathroom for a shower only produced an anxious bird who refused offers of a high perch on the curtain rod. I had heard of these mythical creatures, but earnestly doubted the existence of a water-hating parrot. I haughtily argued that keepers of such birds simply had not found the right avenue through which the parrot preferred bathing. My arrogance got the best of me, for I was quickly stumped by Sam’s constant rebuffs. From the moment Sam arrived at my house, he knew nothing but positive reinforcement through his interactions with me. I knew that he was familiar with the ‘step-up’ cue. However, clearly he needed to establish a history with me before he would offer me such a privilege. Shortly thereafter, we achieved a very reliable flighted recall, as well as a few other cued behaviors that improved our day-to-day rituals and duties. Regardless of how Sam reached his current aversion to bathing, be it through early individual preference or aversive experiences later on in life, it was only natural to me to achieve this seemingly basic need through positive reinforcement. Arriving at that idea was the easy part. Formulating a training plan in which bathing Sam was entirely by his own volition proved a little more difficult. I contemplated several permutations of my plan. I could start by rewarding a small, short spray of water on his tail or feet and slowly increase the sprays. Or I could reinforce Sam staying still while he was getting sprayed. I did not like either of these options, however, because neither involved him accepting water by choice. I stepped back and thought about my student and what made up the advantages and disadvantages of this particular scenario. The three things I had going for me included the fact that he would try to bathe in his water dish when the vacuum cleaner was running in the bird room, that he was rapidly becoming desensitized to the presence of the spray bottle when he realized I was not going to spray him, and I had three extremely exuberant role models to show him how fun showering can be. The disadvantages included his aversion to the bathroom and his intolerance of an accidental indirect mist when he ambled in closer to the three showering parrots. My first idea was to offer a larger water bowl in which to bath when he showed interest in dousing himself during morning vacuuming duties. I felt like this would be the least intrusive, and I also was beginning with a bit of a head start, since he was attempting to bathe in his much to small water dish. It was a little bit cumbersome, but the lack of convenience was worth it to me if this was his preferred method. While he had no problem drinking from the larger bowl, bathing in it was out of the question. I tried gently misting him from afar while he bathed in his smaller water dish, but this method was also met with failure. My next attempt was to see if he could learn to enjoy showers with me. In effort to get him to enjoy the bathroom more, I began tucking nuts among the towels and linens so that he could forage while I showered. Though I was successful in achieving his acceptance of the bathroom, this approach did nothing in the way of diminishing his repugnance for water. Then rather suddenly, I asked myself a simple question. In fact, it was so simple it pained me: How can I set up the environment in a stepwise program that encourages Sam to make a physical effort to be sprayed? This question, of course, is the heart of every training plan, but without verbalizing it, the very idea had been lost to me. I decided to give my new plan a shot and could hardly wait to try it out. The most important stage was to outline the steps in the program. First, Sam had to walk through a small spray of water to receive reinforcement. Then he would need to stay in the spray for successively longer periods of time. He would need to accept me angling the spray bottle to reach different parts of his body. And then he would need to open his wings on cue for them to be misted. I knew that I would probably have to tweak the plan based on his responses, but I was hopeful that through all this positive history with water, in the end he would develop the exuberance that the other three birds show when getting bathed. 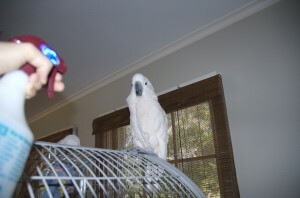 I used the large flat top of a folding travel cage that would take Sam many steps to walk the length. Sam sat on one end, and I placed my farthest fist out to which he should target (he had previously learned to target to an exposed knuckle on my bent index finger) with my closer hand holding the spray bottle. First, he had to just walk past the spray bottle to target to my fist. Then I introduced my puny little squirt that was continuously coming out of the bottle. He showed some reluctance, so I ended up opening my fist to show the food and luring him past the water. I was mixing up his favorite treats of dried papaya, almond bits, and cheese. After a few times of walking through, I phased out showing the food reinforce and went back to targeting. He walked through the spray twice after that, and I ended the session with a jackpot reward of a large hunk of banana. The next session came two days later, and I started with a puny spray of water. Sam walked around it and targeted to my fist. Smart bird! I rearranged my fist so it was closer to the spray bottle but he still had to step out of the water in order to receive his reinforce. He walked through the spray a few times and did not seem the least bit perturbed with the water hitting his breast. We quickly ended on a high note, with another jackpot reward at the end. I was excited and anxious to see how the plan progressed. Sam’s distaste for showering dictated the place of the session and when to end. I wanted to avoid any aversive interactions asscociated with water and the spray bottle, so we moved very slowly. Even still, Sam refused to go through the water spray after a few sessions. I tried larger rewards, luring him rather than just targeting, and rearranging the environment. Sam did not want to walk through the water. I was trying not to get frustrated or disheartened, as previous training programs have often included a plateau or regression for a short time period. In the end, persistence had always paid off, as well as maintaining positive interactions, rather than trying to force the behavior through less desirable tactics, like negative reinforcement or flooding. So I kept offering our training session and showered my other three birds regularly with Sam out and able to join in if he chose, or at least come close. Even during our plateau, Sam’s behavior began to change outside of our training “classes.” He showed an increased interest in the showering sessions with the rest of the flock. He would fly near the bathing area and watch with a growing curiosity. From a far perch, he would hold his wings out and fluff his feathers like the others do when showering, while imitating the noise of the repeated squeeze of the spray bottle (with amazing accuracy, I might add!) Similarly, where an accidental misting had previously sent him flying to the end of the room, he began showing a greater tolerance for these while he sat near the soaking wet flock. Slowly, Sam began coming back around during our training sessions by his choice. Through targeting, he would soon stay in the spray for two squirts of the water, and we gradually began increasing these. Some steps took longer to fulfill, while others I was able to omit completely. For instance, I did not need to cue him to raise his wings to be sprayed; he did that on his own accord. Due to a cross-country move which interrupted our training, it is difficult to say exactly how long the process took. Over the course of around two months, Sam evolved from a water-hater to an eager participant. In essence, I was using the water stream as a target by which he would receive his reinforcement. I have received some comments of disbelief that I refused to bathe Sam until he learned to accept showering voluntarily, but I was adamant that forcing him into such an act, particularly with regard to his extreme dislike of water, would only prolong the training and damage our relationship. And indeed, since I reached my objective with Sam’s showers, I have met a few people who felt so strongly that their parrots needed to be bathed or showered no matter how the parrot felt about water, that their relationships have suffered considerably. Although he still has not reached the point where he was shown the exuberant behaviors the rest of the flock does**(see update), he has shown not just a tolerance but a willingness to get his feathers wet. However, I am confident that through time and a history of positive associations with water, aided considerably by willing demonstrations of the other cockatoos, Sam’s participation will progress even more. I believe this method is highly replicable for others to teach their reluctant bathers to enjoy water. The key factors in our success were outlining a plan that met the standards of positive reinforcement, identifying the advantages of our individual situation and building on them, and proceeding extremely slowly and maintaining patience as the student learned to overcome his deep-seeded dislikes. After several weeks of working with the spray bottle, Sam suddenly decided one day that showers were absolutely fantastic! 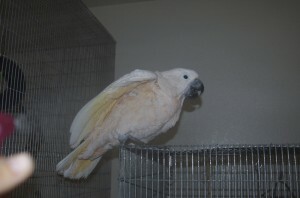 Since then, once or twice a month he opts to shower with the other cockatoos. We let him bathe however often he desires and never force him to take water. Just goes to show how the effect of positive reinforcement does not always follow a linear, step-wise path!